Watercolored for a friend who needs good thoughts. As I post this I am listening to the D-Day ceremony in Normandy. I remain overwhelmed with gratitude, admiration, and pride at the numbers of men who literally put one foot in front of the other, saving the world from madness. If you wondered what that thud was, it was the sound of my jaw hitting the floor! Wow. This is gorgeous, Joan! The watercoloring is everything watercoloring should be:) Have a great weekend! Holy cow, Joan, that is breathtaking. Can you explain how you did that -- it looks so ethereal, like wisps on the clouds...Just spectacular! Merry, yes it is quite easy. White embossing on watercolor paper. then add watercolors (I used Tombow pens and distress inks) with water and a paint brush. Let each color dry. I'll make another card and do photos. In the meantime, check out Kristina Werner's latest video -- it is up today. She uses a very similar technique and her results are amazing. Beautiful, Joan! 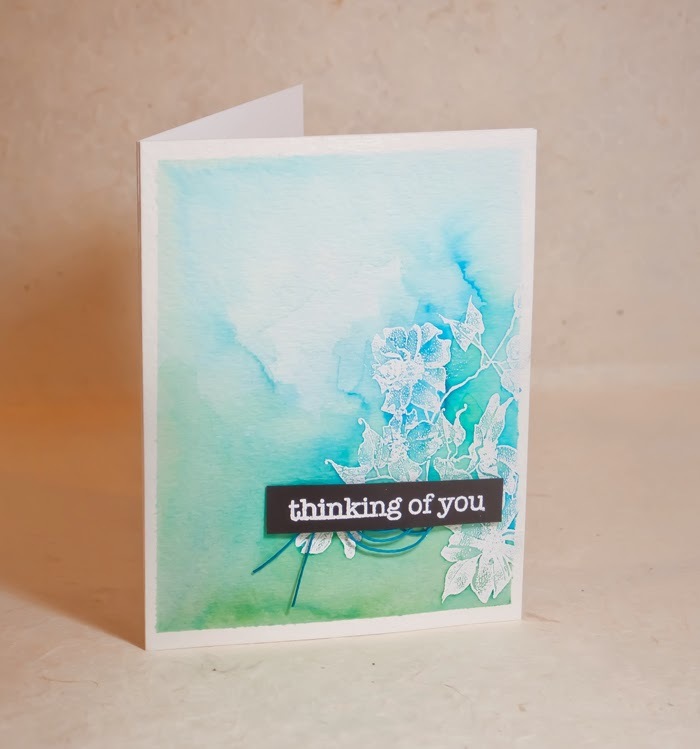 Oh, my goodness, the white on that lovely watercolored background is a dream! What a beauty! The watercolor is simply outstanding, Joan. What a beautiful card, Joan! I watched a bit of the D-Day coverage on CNN while waiting for car service this morning. I liked that all the dignitaries were escorted by children at the Sword Beach ceremony. I love this card Joan. So right to put the sentiment onto black card stock. WOW! This is beautiful....just perfect. I don't do a lot of commenting on anyone's blog but I just had to let you know how much I love this card. Your card is lovely Joan. Stunning, Joan. The white is gorgeous with the blue/green tones. I'm just seeing this for the first time, and it's stunning! I love how it turned out. I hope you were super pleased with it, because it is gorgeous!